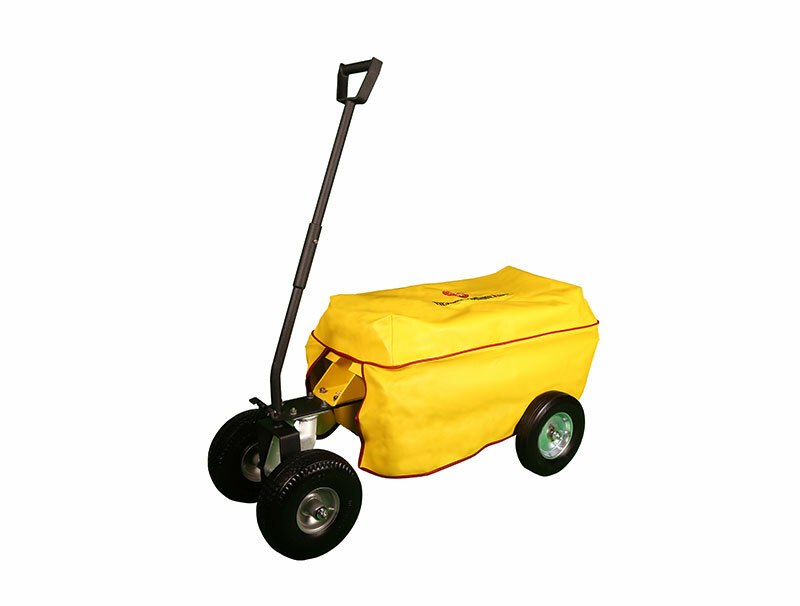 *Unit comes with two front wheels for added safety on non-truck mount version. 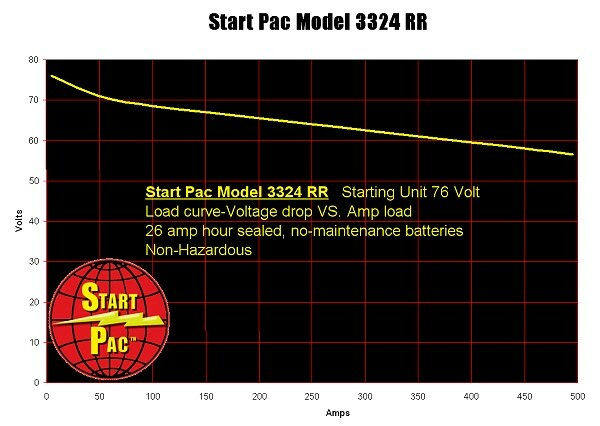 Start Pac carries the leading railroad locomotive starter unit on the market. 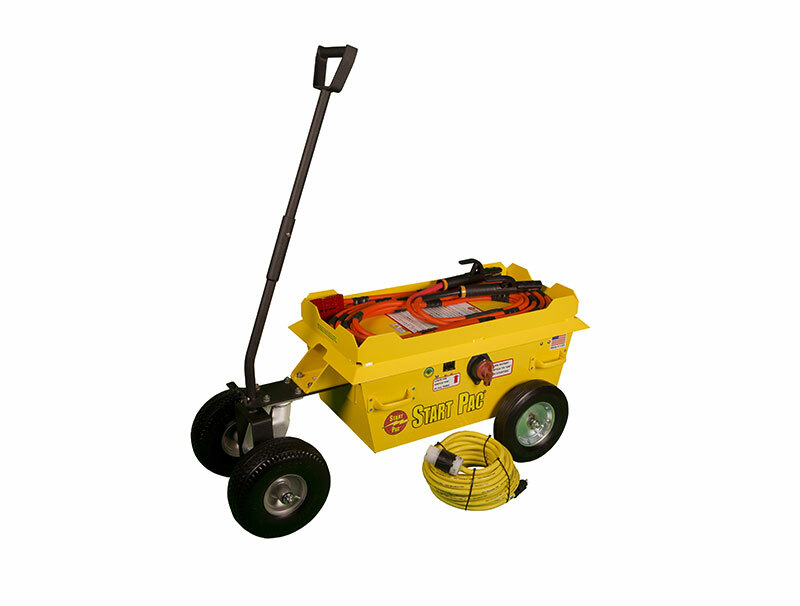 This American made Patent Pending lightweight mobile ground power unit is designed to directly start the locomotive engine when the locomotive battery is not sufficiently charged or capable of starting the engine. The 3324RR locomotive engine starting maintenance unit can be manufactured with wheels or without wheels to be truck mounted. This unit is designed to jump start locomotive engines up to 3500 horse power; it is not designed for battery charging. Dimensions: L 38″ x W 21″ x H 20″/L 96.52cm x W 53.34cm x H 50.8cm; Handle Height 48″/121.92cm. Emergency Disconnect- this is a rotary type switch on the outside of the case that disconnects the battery bank from the output cables to the locomotive. Reverse Polarity Detector- this is a safety feature installed into the cables near the alligator clamps that connect to the locomotive so that the operator will see the reverse polarity detector light illuminate if the clamps are connected in the reverse position. This unit is designed to start diesel engines up to 3500 horse power, but will not overcome a dead locomotive battery at the same time. In this case, disconnect the locomotive battery. The GPU is rated at 330 CCA. Multi-unit chargers offer redundant field reliability. Units can be serviced in the field if needed when conducting locomotive maintenance. Model 3324RR weighs 215 lbs. 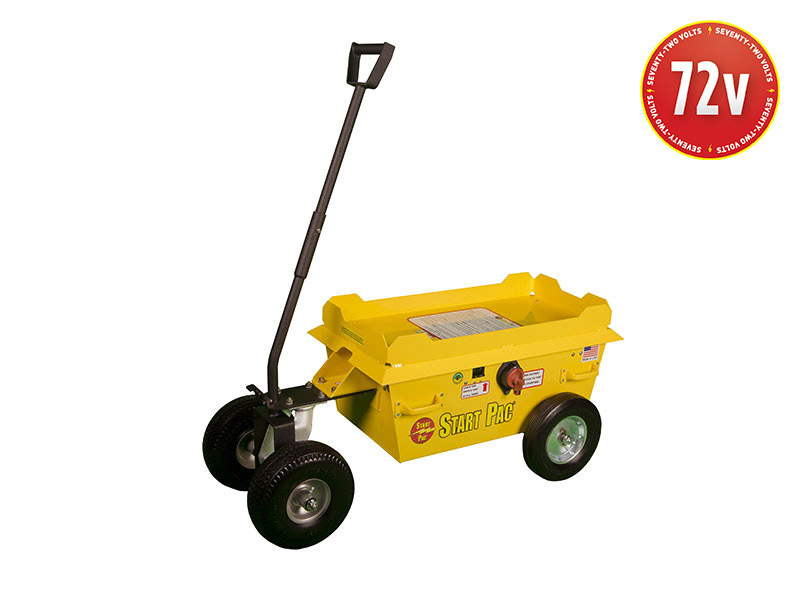 with dimensions 38″x21″x20″ and is pulled by hand or by a tug. The handle is 48” high. Locking the handle in an upright position sets the brake for this railroad locomotive starter GPU. Power cables are normally 25′ but can be up to 35′. 800 amp alligator clamps can be installed if required. PLEASE NOTE: When trying to start a locomotive with a dead battery, the battery must be disconnected (knife switch). NOTE: Always recharge the GPU until green charger lights appear. Once charged, it is not necessary to leave the unit turned on. If a heater is installed, leave unit plugged in. 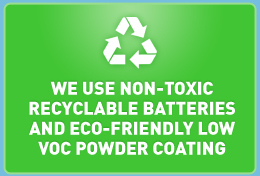 Always recharge soon after being used to prevent sulfation of the batteries. CAUTION- When using the emergency disconnect, whether activating or deactivating, there should be no load on the Start Pac® batteries from the locomotive. Severe arcing will result which will cause damage to the relays. Therefore, only use the disconnect under normal operations while the Start Pac® is unloaded except in an emergency.